• Active Compliance Management: ACM is a patent-pending, unique hybrid design that combines the attributes of direct radiating and band-pass configurations to reduce distortion and increase sound pressure output while decreasing box size. • Tons of horsepower: Onboard amplifier supplies 750W pure sine wave power (1800W “peak” power) to each woofer. 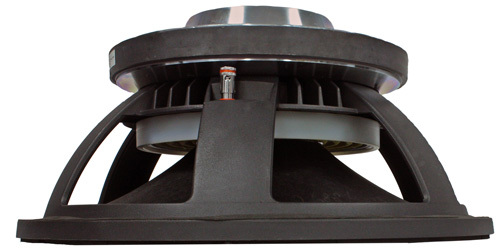 • Purpose-designed transducers: Dual spider, long excursion woofers features large, 4-inch voice coils for increased power handling and reduced power compression. • Built for the road: Premium birch plywood enclosure with extensive internal bracing and a highly-durable Dura Coat finish. • Standard IP for easy networking onboard: Simply plug in, and the system automatically connects to virtually any kind of IP configuration. • Directly supports virtually any input configuration including: Analogue, AES/EBU Digital and Dante network audio steams. Think of the hs-25 as the hs-28’s “bully” little brother. This is our second product to deploy our patent-pending Active Compliance Management technology. ACM combines both band-pass and vented alignments into a single enclosure. The hs-25 places two precision-designed, 15-inch transducers into this configuration, with both woofers sharing a common vented chamber. One woofer’s frontal radiation is direct, while the second woofer’s frontal radiation drives the band-pass chamber. Onboard electronics include amplifier module that supplies 830W pure sine wave power (2000W “peak” power) to each woofer and DSP to ensures the precise phase arrivals of the front facing woofer and both vents. The combination of ACM, sophisticated DSP and active electronics allow the hs-25 to deliver much higher output throughout its operating bandwidth from a footprint that’s smaller that most dual 15-inch vented designs.